On 01 June, Air France KLM’s Flying Blue program will change, quite radically, the redemption logic. It will introduce a city-pair specific pricing, coupled with a dynamic pricing. There is some logic to the system, but things won’t get simpler for customers. Since not too many nice things are said and heard about Aeroplan these days, let’s start with a positive reference to them. Several years ago, they introduced a new redemption model for Air Canada flight, which was indeed rather smart. They kept a traditional award table for capacity-restricted awards, but also offered dynamic award pricing for seats in other booking classes, strongly aligned to revenue management and market fares. Depending on the current fare picture, this sometimes even leads to dynamically priced awards being cheaper than the capacity-restricted awards, but usually they obviously ran at higher prices. This model certainly served Flying Blue as inspiration when tackling the redemption side as third element in its redesign process, next to switching to a revenue basis on the accrual side and the introduction of status points (which they call, for some strange reason, XP – Experience Points). While we won’t know what the dynamic pricing will really look like in reality until 01 June – will the last seat be rather reasonably priced, let’s say not more than 3 times the lowest level, or follow the South African model, where a Business Class long-haul flight can easily cost 1 million miles? -, Flying Blue went, however, two important steps further than Aeroplan. First, the restricted capacity award level is now fully based on O&Ds. Flying from Paris to New York is a different price than from Paris to Los Angeles or Amsterdam to New York. And New York is not New York: Flights to Newark are more expensive than to JFK. All this reflects average fare structures and hence a certain logic. But that also means that adding a connecting flight might make things cheaper: While an Air France roundtrip flight from Paris to Los Angeles in Economy Class will feature a minimum mileage amount of 54,000 miles, it will actually only be 43,000 miles if you start your journey in Zurich, connecting through Paris. However, in Business Class, it will be 135,000 vs. 144,000 miles in favour of Paris. Secondly, an O&D pricing also applies to all partner airlines, where obviously only the restricted award level is applicable. But here, the sophistication has actually its limits. All Korean Air flights between Seoul and Japan or Northern China are priced at the same level. The same more simplified mechanisms can be observed with other partner airlines, with some prices up and some down, compared to the status quo, although award levels tend to be more fine-tuned than before. No doubt, these steps come closer to perfection when you look at it through the glasses of the airline. But it makes things less transparent for clients. 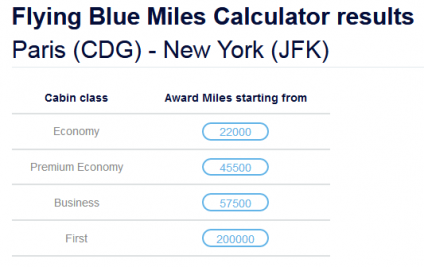 Even when leaving the discussion aside how easy it might become for Flying Blue to “adjust” these minimum miles levels without informing anybody about it in a similar manner to what its partner Delta does, the question is whether this degree of perfection is really worth the loss of simplicity. Making the program simpler was one of the key objectives of the program redesign. While this has been achieved with the straight-forward status points system, any potentially overall positive impression in terms of simplicity got killed by the redemption side. Is that degree of perfection though worth the confusion and fears it creates with customers? How difficult would it have been to say transatlantic Economy awards continue to cost 50,000 miles at the capacity-restricted level? I am sure that the average price paid by customers on Transatlantic routes at that minimum level will end up anywhere between 49,000 and 51,000 miles over the year. Is the majority of members really motivated to go to the West Coast if one actually needs to go to the East Coast just because the value per mile you could get out of that award is slightly higher? What anybody can learn from that is that it remains very difficult, not only with the redemption question, to maintain a healthy balance between the airline and the client perspective. The Flying Blue example is the classical showcase where the airline perspective prevails. In times when everybody talks about customer engagement, program operators are well advised to look at anything they do from a customer perspective. Even if an underlying intention might not be so nasty in the end, it can otherwise backfire on you. The judgement on the Flying Blue changes is still out. If you look at things rationally – and don’t pick any of the three elements in an isolated manner -, not everything got worse for everybody indeed. But except for the fully engaged member working out the details, many members risk losing interest in the program since they lack the former transparency. But it is exactly that transparency, which is as essential for loyalty programs in building a trustful relationship as in all other – admittedly less important – areas of life.